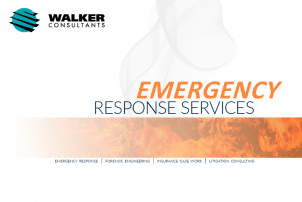 WALKER CONSULTANTS is pleased to introduce its emergency response services. These services will provide experienced and consistent assistance to clients to mitigate damage to the built environment and to expedite your building’s return to service. These services are a strong compliment to the litigation, insurance, forensic engineering, and restoration services we already provide nationally.